REWARD YOUR FANS WITH GIFTS! SHOWCASE YOUR PARTNERS IN THE MOST ENGAGING DIGITAL PROMOTION IN ALL FANDOM!! No promotional format more deeply connects your brand with your fans than gifts! Only an igiftbag provides your partners and sponsors with the most engaging and lasting digital connection to your fans. Whether an entertainment brand or sports team, an igiftbag will enhance your game, entertainment or fan rewards experience! We’ve raised the bar for sponsored digital gifts. We’ve included a creative gift option for every promotional and business goal your partners may have—whether to raise brand awareness, generate sales or educate customers. Partners create gifts for your igiftbag using our automated online tools called Gift Apps. And, they are as simple to use as creating an online party invitation. Our Gift Apps enable partners to choose effective gift options and begin creating them online—a discount offer, an expert download, an expo promotion, a giveaway, among others— in a matter of minutes and review and edit them in real-time. And, it’s just as easy for partners to submit an order for custom gift designed by igiftbag if you want to include custom-designed gifts: Sponsors select their Gift App and design preferences, enter their gift’s details, upload brand images and receive a custom designed gift in a few days comparable in quality to a world-class interactive advertisement. SHOWCASE TEAM, VENUE AND NATIONAL PARTNERS. Leverage and reward your partners by including them in your Fan igiftbag. It’s easy to integrate the igiftbag seamlessly into your partnership relationships. You can setup a partners invitation web page in minutes to promote your igiftbag to all of your internal and external partners and enable them to learn about the igiftbag’s features and benefits, highlight key information and provide the online tools for them to create their gift offer. All aspects of your Fan igiftbag are custom designed, including email invites, gifts, customer gifts interface, a welcome screen message, Gift update Messages, among others. For live performers and shows, the Fan igiftbag can digitally “travel” to every venue and be distributed to fans on their mobile phone, ticket stubs and promoted on event signage and media. Create a partner invitation page in minutes for your partners and sponsors to learn more about creating a gift for your igiftbag. Send custom Gift Invites to them and monitor and track your partners’ responses and progress of your partners on your RSVP and Manage gifts dashboards. With igiftbag’s state-of-the-art analytics reporting, you can monitor the results of your igiftbag in real-time. Called by a major hotel rewards igiftbag partner “the best real-time reporting of a promotion,”* your customized dashboard displays a ranking of your gifts and provides detailed results on click-thrus and click to actions of every item within your igiftbag, among other metrics. Enable your fans to access and use your gifts on-the-go through a locale on their mobile phone or tablet with our personalized “My igiftbag” gift save and plan features. DEPLOY YEAR ROUND WITH MONTHLY GIFT UPDATES. You can make your Fans igiftbag available 365 days a year. 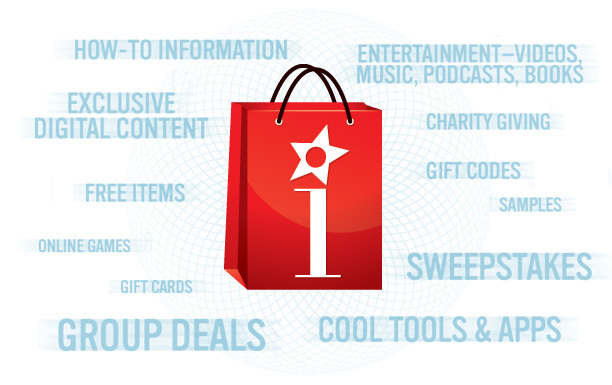 Update and rotate new gifts and partners each month into your igiftbag. Schedule a monthly custom branded Gift Message alert to communicate to customers in their My igiftbag about new gifts that are available. Connect with your fans with updated branded Fan “Gift Messages” that include new gifts distributed directly to your fans’ My igiftbag dashboard. Release your igiftbag to your fans across multiple formats and platforms, including secure email invitations, Web and micro-sites, Venue signage, Facebook and Twitter. THERE’S AN IGIFTBAG FOR EVERY FAN!